The 12th fret is theoretically half the scale length. You have to add about 2 mm (0.08 inches) to the distance from the 12th fret to the bridge to get a proper intonation. If you do not compensate the scale length, then your ukulele will sound sharp in higher frets. It can be half a note sharp in the 12th fret without compensation. The longer the scale length and the higher the action in the 12th fret, the more compensation you need. 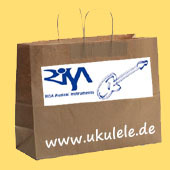 A ukulele usually has a compensation of 2 to 3 mm (0.08 to 0.12 inches). A classical guitar needs about 5 mm (0.2 inches) compensation. For more details read the chapter about Fret theory. The neck should join the body in the 12th or 13th fret. Sometimes it is also the 14th, which improves the reachability of higher frets, but it is bad for the weight balance of your instrument. It is not comfortable to hold a ukulele, which has its center of gravity outside the body. The bridge should be on the widest point of the body. This results in the loudest sound. You can try it. Take a ukulele and knock with your index finger on the top close to the edge. It sounds thin and not very loud. If you knock on the top close to the bridge, it sounds full and loud.